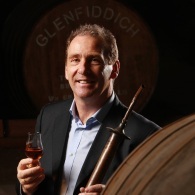 I first joined the industry in 1971 at Blair Athol Distillery in Pitlochry, my home town. I then spent two years in Holland working for Heineken between 1974-76, before returning to whisky again at Blair Athol. So this year marks 40 years in whisky. I guess being invited to manage Glenfiddich, Balvenie and Kininvie Distilleries for Wm Grant and Sons, the biggest Malt Whisky Distilling site in the world. Can you remember your first dram and indeed what it was? It was a 19 year old Blair Athol at the distillery on my 19th birthday. I never liked the smell of whisky so did not drink it at the time. It wasn`t until some years later when I started to manage the Bladnoch Distillery that I took to enjoying a dram of whisky. It’s a product that connects Scotland to the rest of the world, without it nobody would know where Scotland was. As I will be 60 in April this year, five years time will be my retirement year. Not sure if I will hang my glass up or continue on in a scaled back role, a decision I will make closer to the time. Apologies, it was a 50 year old Glenfiddich laid down in 1937/39 and bottled in 1991. I was running a training course for four new Glenfiddich Ambassadors last week and we finished the week with a dram of the 50 year old. Glenfiddich 21 and Creme Brullee. Off brand it would be Chivas and Chicken Satay Malaysia style, had this on a long haul flight out to Asia and it was wicked. When the work is finished for the day and always in company. The best way to enjoy whisky is with good friends. Irish whiskey is seeing more growth right now and China is looking for older and more expensive whiskies. There will be lots of new distilleries popping up and some of the moth-balled ones will be resurrected. Diageo will be increasing the size of a few of their existing distilleries and building a new super Distillery similar to Roseisle. Pernod Ricard will be doing the same. The industry is buoyant right now. Strangely enough it doesn`t exist as I live quite happily without it for long periods, I do enjoy a good whisky in the right circumstances with good friends and it`s generally our 15 year old Glenfiddich Solera. I also love the Mortlach 16 year old from Diageo or the 15/21 year old Bottling that Gordon and MacPhail bottle. Many thanks to Ian Millar. Who will be the next Whisky Insider? Click back soon to find out!